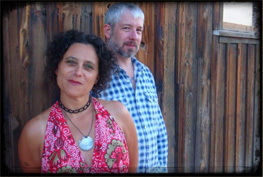 McCabe & Mrs. Miller is a collaboration between Victor Krummenacher (Camper Van Beethoven, Monks of Doom) and Alison Faith Levy (The Sippy Cups, The Loud Family). Having worked together on and off for many years, Alison and Victor have finally realized their dream of writing and performing as a duo. Although it seems an unlikely pairing, their voices blend together in the tradition of classic duets, and their songwriting styles mesh into a fine mix of blues, folk, and country. Digging at the roots of their rootlessness, these songs sweep out the dark corners of longing, regret, and desire with the intimate wit and wisdom of old friends. Their debut album, Time for Leaving, produced by Bruce Kaphan (American Music Club) is out now on Magnetic Motorworks. Between the touring schedules of both of their high-profile bands, they have found the time to tour and perform with the likes of Rosanne Cash, Built to Spill, Cracker, The Black Crowes, Drive-By Truckers, and The Knitters. Their live show has evolved into a formidable, dramatic force, building from a slow burn into a full-on electric blues throwdown. The band also includes Jonathan Segel (CVB) on violin and mandolin, John Hanes on drums, Doug Hilsinger on guitar and Paul Olguin on bass. The band is based in San Francisco.